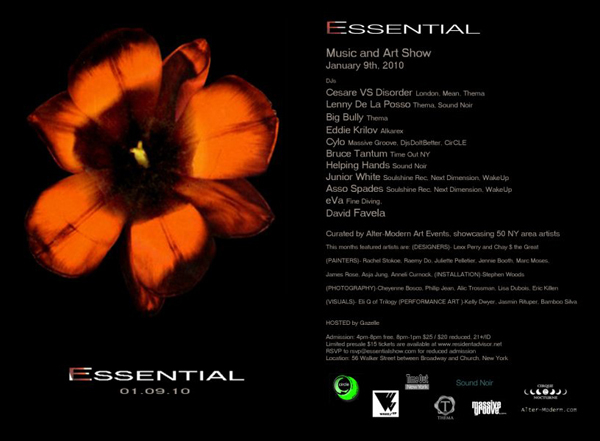 This Saturday night Sound Noir DJs are playing at Essential – a Manhattan loft happening, which is both an art show and a dance party – everybody wins! Featured will be pictorial and sculpted works from over 50 artists, NY based performers, body painters and live musicians. The party side will feature Cesare vs Disorder of London, Sound Noir residents Lenny de la Posso and Helping Hands, plus several other NY DJs. The location is 56 Walker Street between Broadway and Church St in Tribeca and the timeframe is 4pm Saturday till 1pm Sunday. And you can buy presale tickets on RA. Also watch out for the next season of Sound Noir events starting late February!